Is this the ultimate East meets West culinary experience? Crumbed chicken schnitzels, crispy on the outside succulent on the inside. Add layers of avocado and peanut satay yumminess and assemble it all in between slices of crusty toast. A little mint and hey presto it’s multiculturalism at its best! 2 Combine bread crumbs and Continental Creamy Chicken Curry recipe base; spread out on a flat tray. Slice the chicken breasts in half horizontally; pat dry with a paper towel. 3 In a bowl break up the egg with a fork. Dip each chicken piece in the egg then into the crumb mix, pat down firmly on the crumbs to ensure they stick. Spray an oven tray with oil and place chicken. Spray the top of the chicken breast with oil and bake for 20 mins or until cooked. 4 Combine the satay dressing ingredients in a small bowl. 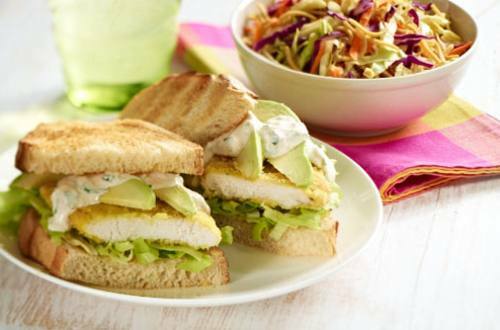 5 Toast the bread, then assemble the burger with lettuce, chicken schnitzel, dressing and sliced avocado.